Kennedy Space Center has been known as America’s spaceport for more than 50 years. From Project Mercury to recent commercial-space missions, the nation has witnessed many amazing launches from the Space Coast to low-Earth orbit and beyond. But another, not-so-well-known area of Kennedy’s expertise is in something not typically sent on its launches: plants. The newest plant-growing experiment on the International Space Station (ISS), Veggie, went live in May of 2014. Veggie uses LED lighting to stimulate plant growth and will provide fresh lettuce and produce to astronauts on the ISS. Because NASA is planning for future visits to distant locations like Mars, however, the agency is researching how to grow plants in space. Live plants would be valuable on space missions because they provide a nutritious food source; offer astronauts a familiar feature from home; provide a pleasurable activity—gardening—while in space; and contribute to cleaning air in a spacecraft. LEDs, or light-emitting diodes, are semiconductors that produce different wavelengths of light depending on the material they are made from. By incorporating different LEDs on a single circuit board, the light can be changed and controlled to include or omit specific wavelengths of light, and at different times. NASA is interested in using LEDs not only for plants but for general lighting needs in spacecraft. This is because LEDs require little power, last a long time, can function in extreme temperatures, are lightweight and shatterproof, don’t give off heat at the light source, and are able to produce specific colors of light. The NSBRI researchers, including George Brainard, a professor of neurology at the Jefferson Medical College at Thomas Jefferson University, found that blue light at a particular spectrum could reduce melatonin production. Melatonin is a hormone that helps to maintain the body’s circadian rhythm, or natural body clock. More melatonin helps people sleep; less disturbs the circadian rhythm. Based on the findings, Brainard and others suspected that the human eye must have photoreceptors, or areas sensitive to light, that don’t have anything to do with vision. Soon after the researchers theorized their idea, it was confirmed when other scientists were able to identify the receptor in the eye. For NASA, this meant lighting could possibly assist in helping astronauts avoid sleep deprivation. Because astronauts see more than a dozen sunrises and sunsets every 24 hours from the International Space Station (ISS), their circadian rhythms are disturbed. On Earth, we are exposed to different wavelengths of light at certain times, and our circadian rhythms acclimate to this schedule. Sunlight, for example, signals that it is time to be awake. But when astronauts see the sun appear and disappear many times in a matter of 24 hours, it affects their ability to get to sleep. In addition to building the LED lighting used in the NSBRI research, the Kennedy team also started developing the first prototype LED system for the ISS. They worked with a NASA contractor, Bionetics, and by 2008 the system was installed in the station, where it continues to function successfully. 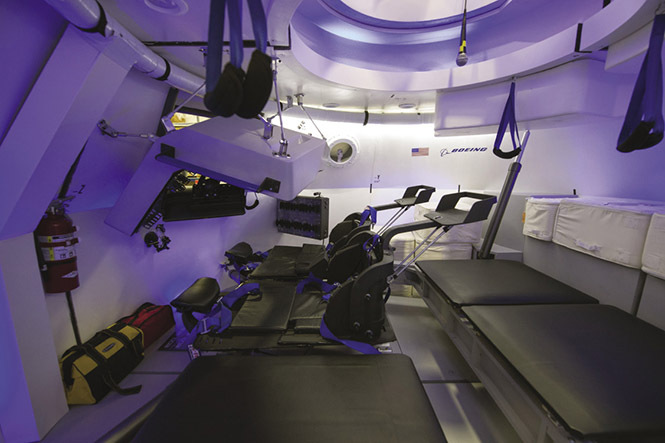 Commercial crew vessels, such as the mockup of Boeing’s CST-100 shown here, are all adopting LED lighting technology as a way to save electricity, extend the life of lighting sources, and potentially help crews manage their biological rhythms as they adjust to life in space. 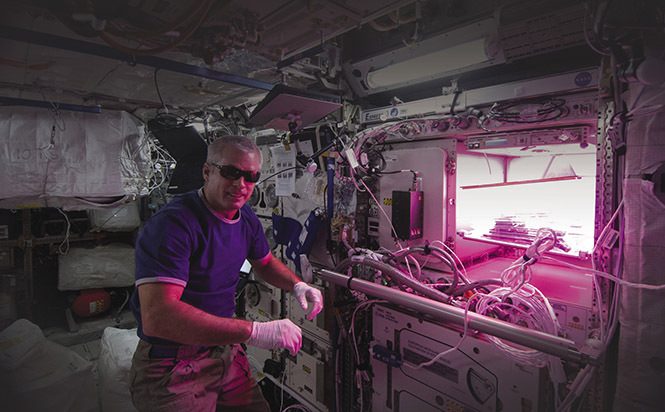 After the installation of the system on the ISS, Robert Soler, a lighting science expert with Bionetics at the time, started working with Satellite Beach, Florida-based Lighting Science to help bring the developments of LED lighting for space back down to Earth. Several other scientists and engineers involved with the LED work at Kennedy also brought their expertise to the Florida company; their aim was to develop and commercialize new LED products to benefit people, plants, animals, and the environment. By late 2013, Lighting Science launched a new line of lighting called DefinityDigital. The family of products includes four LED lights: Awake & Alert, Goodnight, MyNature Grow, and MyNature Coastal. “A lot of NASA’s learning, science, and research has led to these new products,” says Soler. 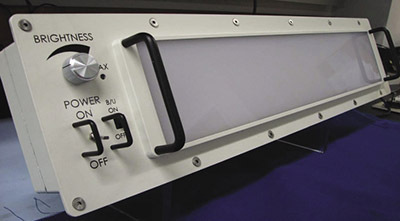 NASA’s solid state lighting module, which was flown to and used on the ISS in place of traditional fluorescent lighting. The LED module could be controlled from the ground and uses different colors of light in an attempt to induce focus and alertness or rest and relaxation as needed. 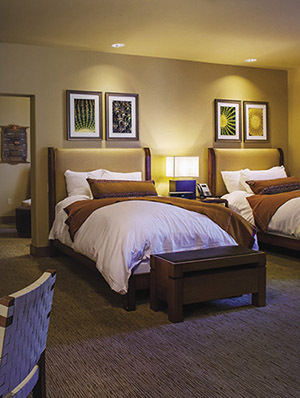 One hotel chain replaced all of its bedside light bulbs with LED bulbs from Lighting Science. The new bulbs emit significantly less blue light, which would otherwise send signals to the body that it should be up and awake. According to the company, the Awake & Alert light promotes natural energy, alertness, focus, and overall performance. Some of the places where it could have the biggest benefits include gyms, schools, libraries, hospitals, in common spaces in senior centers, and in homes and offices. Recommended for everyday use, it can also be particularly beneficial during times of the year when people experience seasonal affective disorder, as well as for people who experience delayed sleep phase disorder. The 9-watt bulb is meant to replace a 65-watt bulb, and it uses a patented spectrum filter with blue-enriched white light. “Even though these are white LEDs, they put out a blue peak,” says Soler. In contrast, the Goodnight LED bulb from Lighting Science emits significantly less blue light than regular light bulbs, with the intention of supporting natural melatonin production. According to the company, the Goodnight light does not affect sleep as much as regular lights. Lighting Science’s MyNature Grow, part of its Definity Digital line of products, targets the key portions of the spectrum that deliver the right kind of light to encourage healthy plant growth. 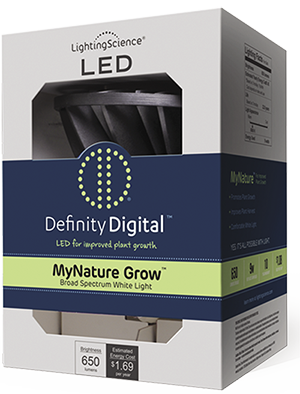 The third DefinityDigital product—MyNature Grow—was designed by Lighting Science to deliver more blue and red light per watt than typical gardening lights. This LED can be used with any plant species, and because it does not radiate heat, the plant can be situated closer to the lighting source. According to the company, these LEDs last an average of 50,000 hours, resulting in energy and maintenance cost savings. Applications include urban farming, propagation research, indoor hobby gardening, agrotech research, hydroculture farming, and floriculture. A similar DefinityDigital product, MyNature Coastal, was designed to deliver lighting that does not attract sea turtles. When sea turtle eggs hatch on the shore, the hatchlings are attracted inland by regular white lights, and instead of going to the ocean they move toward the buildings and roads. Lighting Science’s MyNature Coastal LED is in the amber spectrum and does not attract turtles. During hatching season, regular light bulbs can be replaced with the MyNature Coastal light at resorts, residences, municipalities, parks, restaurants, and marinas. In addition to developing new products for use on Earth, Lighting Science has also won a contract to work in partnership with Bionetics to develop the next generation of lighting fixtures for the ISS. These new lights will incorporate some of the same features found in their spinoff technology and will provide light for astronauts to help overcome sleep and circadian disruptions during spaceflight. As Shultz says, “LEDs are going to be lighting every spacecraft from here on out.” In the meantime, they are beginning to light up buildings, homes, and coastal areas right here on Earth.